It’s wedding season! Whether you’re planning a wedding or simply planning to attend one, look no further for that unique and interesting favor or gift. Share the perfect wedding favor…private labeled olive oil. A favorite wedding tradition is to provide every guest with a remembrance of the happy occasion. What better way to introduce friends and family to the “olive lifestyle” than with a personalized gift? Design your own label for bottles of extra virgin olive oil as a favor for your wedding guests. Your personalized label can include the names of the bride and groom and their wedding date. 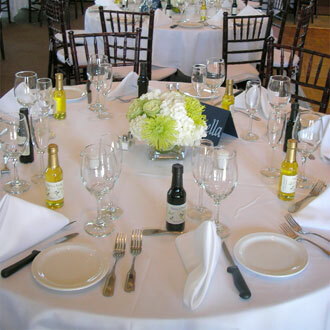 Or, you can decorate small bottles of olive oil with ribbons and cards to match your wedding decor. Give a unique shower or wedding gift…life-long health. Before the big day, put the happy couple on the right path to a healthy life together. At The Olive Oil Source Boutique, create your own olive-themed gift basket with various olive oils, ceramic dipping dishes, serving trays, olive wood salad servers, cutting boards, or tea towels. You may wish to give a beautiful stainless steel fusti so the new couple can preserve olive oil like professionals do. Check out For the Home for other unique ideas. Your gift from The Olive Oil Source is sure to be a “one-of-a-kind”. And one more gift idea… an olive tree. The long-lived olive tree, the ancient symbol of wisdom, peace, hope, light, fertility, health, and wealth, is also a perfect wedding gift for any couple starting a happy home together. Olive trees can be grown in the ground or in a container, and will not only symbolize the longevity of the union, but also represent continued abundance in years to come. In Greece, a common blessing for married couples is: "May you always have bread and wine and olive oil in your house." The tree of wisdom: In Greek mythology, the olive tree was given to the people as a gift from the gods. Athens is named for the goddess of wisdom, Athena, who won the city for her own in a contest against her uncle Poseidon as to who could give the best gift. Poseidon created a spring, whose water turned out to be salty and undrinkable, while Athena’s gift of the olive tree provided the citizens with an everlasting source of food, oil and wood. The tree of peace: Irena, the goddess of peace and daughter of Zeus and Themed, was always depicted with an olive branch in her hand. Later, in periods of war, the couriers of peace were sent holding a symbolic olive branch in their hand. To this day, we still use the phrase, “holding out an olive branch” to indicate cooperation or reconciliation. The tree of hope: In the Old Testament, a dove sent out from the Ark to find dry land returned with an olive branch, announcing the end of the flood and bringing hope to Noah and his family. The tree of fertility: In early medicine, olive oil was considered to be an aphrodisiac. Newly-pressed olive oil was also believed to be a treatment for infertility. The tree of health: Hippocrates, the Father of Medicine, touted the numerous health benefits of olive oil, many of which are being rediscovered today. The tree of wealth: Currently, over 1 billion olive trees grow on six of the seven continents in 20 countries around the world, providing an enormous source of wealth to people around the globe. It’s up to you, but with the growing interest in olive oil and olive oil related gifts and products, your gift will certainly be among the new couple’s favorites. And, if you decide to get the private label favors for your wedding, expect rave reviews. I recently attended a wedding and noticed that the personalized olive oil favors were a great hit. You can well image the many clever comments heard at the dinner tables about how the guests were going to use their olive oil after the reception. The next time I will have to listen more closely – I may get some new ideas to include in my next book!